An exact match to the factory battery. Excellent price and quick delivery. Excellent service from Tayna again. Battery fitted perfectly and has a 4yr guarantee, what's not to like?! Excellent product. Fit perfectly ma Subaru Forester. I am another happy customer of Tayna. I am in Belgium and was not perfectly sure Tayna would deliver the battery to this country. I contacted Tayna by mail and response was very quick answering all my questions in full. Can not call this communication less than perfect. I also checked the prices around in Belgium and on internet. Tayna price was the best by far. Excellent service by all means! Delivery was done by DPD company and also very quick. They even sent an email saying that delivery will be on the certain day between 13:46 and 14:46 ! It was at 14:00. What can I say? Great example of doing business on line and whole respect to customer. 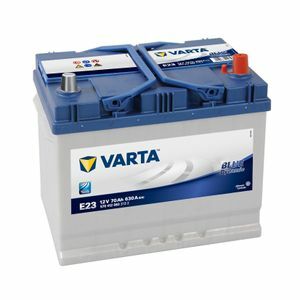 VARTA QUALITY. VERY GOOD PACKED. Excellent heavy duty battery with a 4 year guarantee.Tanya batteries are absolutely superb people and I cannot recommend them highly enough.I tried Bristol Batteries first and I have to say there customer services was appalling.Use these guys and you won't regret it. Excellent fit for my 2005 RX8 and fantastic service. Arrived within 24 hours as promised. Bought for a Mazda 6, no frills, no tricks. It fits in my tray, what else is there to say. As expected it performs well, With 4 years warranty only time will tell. Great upgrade for the E Type - it sprung into life with this new battery and its increased CCA. Well worth the money. Excellent service fast delivery no problems yet. Second time I've bought from Tayna. Excellent service and great batteries. I was surprised to receive a fully discharged battery? However,it did charge up and has held its charge since.Works fine. Tayna All Stars ! Well, the battery is fine as one would expect it to be......but Tayna's service isn't 'fine'........it's BRILLIANT, battery delivered in under 24 hours and perfectly packed.....just amazing, thank you so much ! Fully expect these to last 5 years or more on much used 4.2 Land Cruiser. Delivered as expected, well packaged, all round great service.